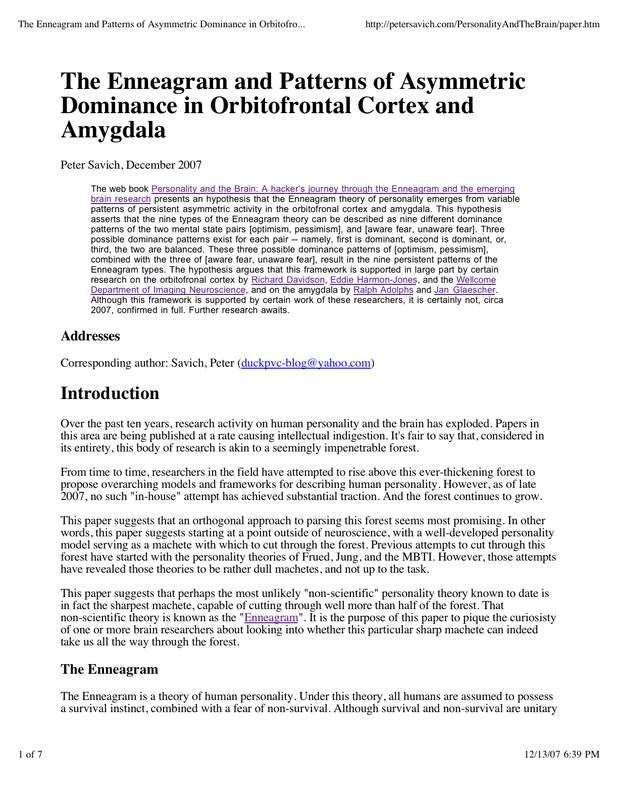 This page offers writings on an hypthesis for connecting the Enneagram theory of personality with the brain. These writings are in the form of a paper, and a book. Essentially, the paper summarizes the book. If you find my paper and/or book at all interesting, you'll definitely be interested in the paper Prefrontal Cortex Dissociation from Amygdala and Personality Types by Eric Lombrozo. Check it out. After two years, I finally got around to writing up a short paper summarizing the main points of the book. Basically, I started with the abstract of the book, and fleshed that text out into a (hopefully) readable paper. Happy reading. In my note of 01/29/07 below, I wrote: "Worse case scenario, krytyk and I keep up an endless 2-person discussion." Actually, that did happen. But it wasn't, by far the worse case scenario. Indeed, the tsunami of spam that the board received and which led to me lock the board in April wasn't even the worse case scenario. Nope. The worse case scenario happened this morning when I logged onto my phpbb discussion board to try to figure out how to delete only the bucket load of spam comments while keeping the great discussions that krptyk pretty much drove. Well I finally did figure out howto do that -- right after I accidenty deleted the whole thing. Well, anyway, no big loss. Seems krytyk and I are just about the only humans on the planet interested in digging this deeply on both the Enneagram and neuroscience. Lots of folks seem endlessly interested in either topic; but few in both. Your take on Chapter 3. Does my parsing of the Enneagram theory in that chapter (ie. boiling the theory down to [optimism,pessimism] + [aware fear, unaware fear]) seem sound to you? Any comments you have on Chapters 4-6. Here I deal with concepts from neuroscience. I'm hoping that some of the 200 of you who have downloaded the book are studying neuroscience. Please "debunk" my arguments in those chapters if you think they need that, or otherwise offer any comments you see fit. Personality and the Brain is a book that I've been writing for the past few years. It's about the Enneagram and the brain. 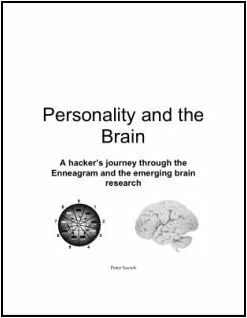 Specifically, the book presents a model for linking the Enneagram to current brain research on PFC and amygdala asymmetry. ... that is, unless you show some interest that motivates me to finish it. Although unfinished, the meat of the book is done, and the model is reasonably clear. So if you're interested in this topic, there's enough here for you sink your teeth into. Below is the book in both HTML and PDF format. You can either download the entire book (it's 1.2MB in size) in PDF form, download the book chapter by chapter in PDF form, or surf through the book chapter by chapter in HTML form. The HTML links are the titles of the chapters, while the PDF forms are accessed via the "pdf" links. In addition, I've set up a link to my blog for the book, plus links for individual chapters, to enable you to comment on the book as whole, as well as chapter by chapter. Acknowledgements, Table of contents, Preface, and Introduction. A 7-page summary of the book. A quick introduction to the Enneagram theory of human personality. Description of the core of the Enneagram: the different types of fears that define personality. An in-depth analysis of the aspect of the Enneagram that makes it amenable to neuroscience. My model for linking the Enneagram to the brain is introduced here. A survey of basic information on the brain relevant to this book. An in-depth analysis of current neuroscientific findings concerning the role of the prefrontal cortex (PFC) in manifesting optimism and pessimism. An in-depth analysis of current neuroscientific findings concerning the role of the amygdala in manifesting aware fear and unaware fear. Chapters I haven't started yet. Should I do so? Let me know by leaving a comment. A rough list of citations to the papers and books this book relies upon.